HELP! Inxs’ lyrics talk of loosing direction and hoping tomorrow will bring a better day. I too am in need of direction and hope that unpacking Inquiry Based Learning (IBL), using Boolean Operators and various databases, will bring me direction and a brighter day. So how do you go about unpacking a theory or methodology? In this instance, reflect on unpacking after a vacation and how tedious, yet memorable the disassembling of the bag minutiae can be – the shared experiences, new encounters and new learning can all come flooding back by picking up a single item. It’s a time for reflecting on the old (must discard those socks), the new, and steps you took along the way. Unpacking Inquiry Based Learning may not be the aftermath of that long awaited vacation, however, it has shared experiences, new discoveries/learning and reflection on the steps implemented to achieve a solution or outcome. Reflection is a dominant element of this process and supports learning through critical thinking skills. Creating mind maps is just one method which can assist with the development of critical thinking skills and it offers the developer a point of reference for reflection. the results of searches I conducted. “Focus on Inquiry – A Teacher’s Guideline to Implementing Inquiry- Based Learning­” (2004), Alberta Education – Inquiry based learning uncovered. Good overview of all IBL elements and addresses scaffolding, critical thinking, model, design of activities, phases for planning/teaching. “Implementation of Inquiry based learning in day to day teaching: a synthesis”, Maab & Artigue (2013). Addresses issues surrounding the large scale implementation of IBL. At this stage I refined the parameters of the search using Boolean and introduced another element from the mind map – information technology. “Inquiry-based learning and Information Literacy” (2010) McKinney, P. The report summarises the relationship between IBL and information technology. This will address another point from my mind map. “Inquiry based learning activities: developing opportunities”, Branch, J.L, Solowan, D.G., (2004) Abstract of paper is considering options for implementing IBL. Particularly interested in the strategies, however, cannot access paper. 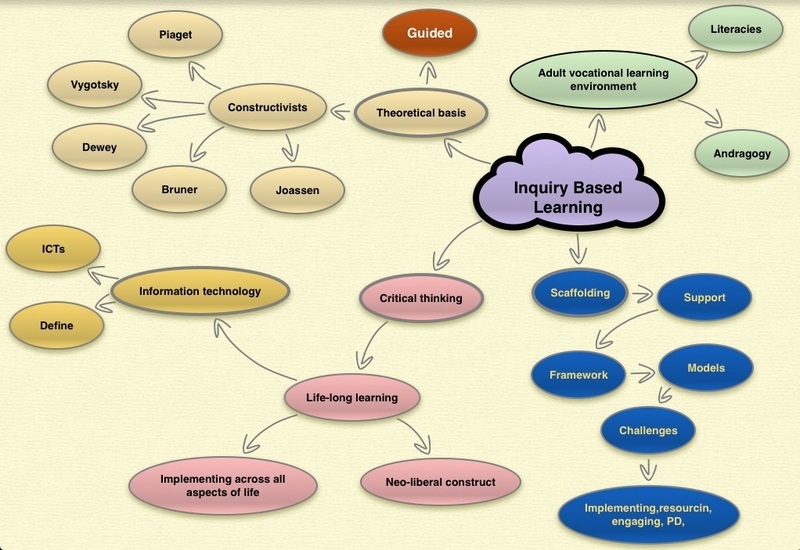 “Understanding and assessing Inquiry-based learning”, Branch, J.L. (2004) No link to the article. Very disappointing as teachers are always interested in how to capture evidence for assessment. “Internet courses for lifelong learning: a model for incorporating web component into a course”, Duffill, C. (2000). The title was promising with lifelong mentioned, however, the research was conducted in 1997-99 with university students. My mission is to use the existing phrases and parameters and now introduce “enquiry” into the search. “The impact of using inquiry based learning as a teaching methodology on the development of critical thinking”, Magnussen et al (2000). Promising title, but the research is based on the nursing sector and research was conducted 14 years ago. Quick scan and results for critical thinking were very interesting. Introducing enquiry into the equation blew out the results. Back to the previous search. “Teaching information literacy for Inquiry-Based Learning”, Ison, S. (2010). This is a review of Hepworth and Walton’s book. Great source to follow up. “Refreshing Information Literacy: Learning from recent British information literacy models”, Martin, J. (2013). To support teacher for Module 2. Discusses lifelong learning, critical thinking and IL models. Promising reference. From my searching I also verified a long held belief that the web is littered with articles which have not been critiqued. Some articles have been rigorously reviewed while others, well let’s just say, the lack of any referencing or links to sources had me packing my bag. This experience was as much about unpacking Boolean Operators and search terms and/or phrases as unpacking IBL. I hoped that consulting the Tips section for ProQuest would give me greater insight and refinement for conducting searches, however, the SU.EXTRA (inquiry based learning) search produced zero results. I will pursue these tips in the hope I can locate articles to support my research. Final result – 10,000,000 (Google) to 9 for my researching. I located a few promising articles which I will review in my annotated bibliography. Until then keeping Googling! It looks like you’ve done a lot of searching here across Google and ProQuest to find some of your articles. I too am a visual learner and appreciate your mindmap that you were able to create using Inspiration – that’s a really neat summary of your search terms. Thanks for sharing that resource, I’m going to go take a look when I get the chance. It may pay to have a good look at the requirements of the task that Mandy has put up on the inquirymodules.wordpress website. Mandy has asked us in our initial post to pose three questions that we are interested in examining. I’m sure that you have three initial questions, so you’ll need to include these somewhere. It seems that in this initial post you have combined your introduction, annotated bibliography plus some searching strategies. You’ve got until Sunday to go back through this and see if you can separate these out but it’s going to take a lot of work. It’s taken me many hours to get mine “off the ground” and I feel it has a long way to go yet! I missed the reference to “searching for my hat?” You mention a song but as I’m unfamiliar with it, I’m left adrift wondering where you were going with that metaphor. Perhaps a picture or something might be helpful. Good luck Mary. Hi again Mary… I found the previous posts on your blog, so please ignore my two criticisms above about the initial post/ questions – found it! and about this being an initial post – you can delete both of these comments if you wish now! My sincerest apologies to you. I’m sure that you’re madly trying to work out your annotated bibliography and the essay, so I’ll leave you in peace. For some reason, I thought that this was the only post that you’d completed but you’ve also got two other ones hiding sneakily away on the sidebar.